Dexter has a great line of shoes our there ladies! The Raquel IV's White/Blue are a standard universal soled shoe that comes with the microfiber slide sole on the bottom of both shoes. These shoes are made with man made uppers for comfort and are also very affordable. These are the best bowling shoes! So comfortable and perfect! Absolutely love them! Very comfortable from the first time! An excellent bowling shoe. Would highly recommend. Great question Bonnie! From the feedback we have received, this shoe seems to run true to size. Hi Jan! Yes, these shoes do come in a wide width. You will need to select the ones that say "wide width" in the title of the shoe. The shoes at the bowling alley have been used by a ton of people and have been worn in by a lot of people so they will not fit the same. is this a good shoe for a left hand bowler? Yes, this shoe would be excellent for a left handed bowler. 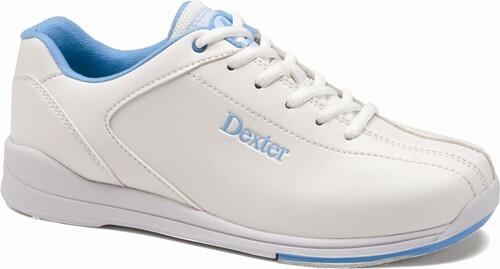 Due to the time it takes to produce the Dexter Womens Raquel IV White/Blue ball it will ship in 2 bus. days. We cannot ship this ball outside the United States.